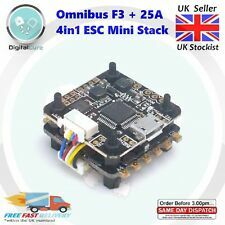 Omnibus F4 25A 4-in-1 ESC 20x20mm Mini Stack. 25A 4in1 ESC Omnibus F3 Features Onboard OSD. This mini 25A 4-in-1 (4x25A) BLHeli_S ESC features the powerful BusyBee2 (EFM8BB21F16) chip that runs at at 48MHz, twice the speed of previous BLHeli_S ESCs. Omnibus F3 25A 4-in-1 ESC 20x20mm Mini Stack. 25A 4in1 ESC Mounting: 20x20mm (M2.5). 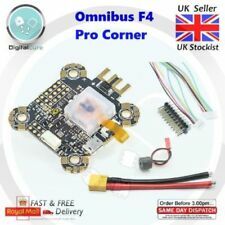 Omnibus F3 Features Betaflight Firmware target :OMNIBUS. Onboard OSD. This mini 25A 4-in-1 (4x25A) BLHeli_S ESC features the powerful BusyBee2 (EFM8BB21F16) chip that runs at at 48MHz, twice the speed of previous BLHeli_S ESCs. OpenPilot has tried to make your experience with the CC3D as easy and trouble-free as possible. Naturally for a high-end product, the hardware is complete; there is nothing to solder. The included RC harness allows you to connect any standard PWM receiver. STM32 F745 MCU, runs betaflight_3.2.0_OMNIBUSF7. OSD: AT7456E. BEC: 5V/2A. Dual sensors of MPU6000 ICM-20608 both use SPI bus communication, high transmission rate. 1 x 6 Pin x 1.0mm cable. 1 x 8 Pin x 1.0mm cable. 1x Airbot Omnibus F4 V6 - Pre-flashed with BetaFlight v3.5.2 or later. Now the latest addition to the series uses the performance STM32 F405 MCU. Latest generation STM32 F405 MCU (168Mhz). MCU : STM32 F405. Gyro sensor : MPU6000. BEC : 5V @ 3A. With Current Sensor. Supports latest Betaflight firmware 3.2.0 or above. BOOT button: to flash firmware. LED: Programmable LED_Strip signal line output. Any item that is designated 'Sold As Seen' implies no warranty. Utilizing the an F3 chip processor with built in CleanFlight or BetaFlight firmware, the PIKO BLX utilizes industry leading components with an included LC filter for the very best in signal reception with a 2A 5V BEC and a built in Sbus inverter. Version: Full Version. Modern 32-bit processor (STM32 F103) running at 3.3V/72MHz. This is for your protection as well as ours. Width: 36mm. Soft Ferrite Rings 16x7x10 (5pc) - Ferrite EMI damper rings, ideal for UBEC's, ESC's, servo leads or any other application where electromagnetic interference may cause problems. Weight: 4.4g(Each). The CC3D provides a crisp feel when flying tricopters, quads, hexas, octocopters, and even fixed wing planes. This OpenPilot CC3D Atom board also includes a high quality, protective case. 4 layer PCB for superior electrical noise reduction and flight performance. Supports Cleanflight & BetaFlight. Along with the Mini 25A 4in1 ESC this setup essentially takes the best of the Omnibus F3 and makes it tiny and stackable, allowing you to build the smallest flight stack for your micro FPV quadcopter. Model: HGLRC XJB F428. 28A 2-4S Blheli_S BB2 4in1 ESC Built-in BETAFLIGHT OSD to adjust PID. 1 28A Blheli_S 4in1 ESC. Built-in Betaflight OSD to adjust PID. Hole mounting size M2 20 20mm. Size: 25 25mm board, 20 20mm mounting holes (M2). Support BLheli suite ESC programming. Firmware: betaflight_3.2.0_OMNIBUS. Built-in OSD interface. Current: 5A continuous Max 6A (3 seconds). Active buzzer interface (with buzzer). Board weight: 2.8 g.
Add switch channel to switch mode during flight. Working Volt:3.5-6v. Weight:about 6g. Size:26 39mm. Specification: Brand Suleve Model: M2NH3 Nut & Screw Sets MaterialNylon ColorWhiteBox Feature: a. Type specification complete, the quality is reliable. b. Never rust, beautiful,practical, durable and convenient for using. c. Packed in a plastic box, good for storage and difficult to damage. d. Nylon has the characteristics of insulativity,Non-Magnetic,thermal insulation,corrosion resistance and etc. e. As electronics components, fit for the industries of communication, electroplating, lab device, office equipment, electronics. Package Included: 1x M2 Nylon Bolt Nut Assortment in Medium and as per pictures. 1 x KBAR 3 Axis Gyro. Supporting 3Pcs servo cable. 1 x 3Pin to 1Pinx3 cable. 2 x 3Pin to 3Pin cable. 1 x USB data cable. Size(L W H) : 30 x 38x 13mm. You can set it via computer or with Android phones via bluetooth. 3 axis gyro for airplane X 1pcs. If item is defective after 3 months, you can still send it back to us. We will send you new one after receive the defective item. 1pc x 3 Axis Gyro for Airplane. If item is defective after 3 months, you can still send it back to us. We will send you new one after receive the defective item. Before you give us neutral. The CC3D board is an all-in-one stabilization hardware which runs the OpenPilot firmware. The CC3D has been designed from the ground up to perform the following functions Tiny 36mmx36mm 4 layer PCB for superior electrical noise reduction and flight performance. Model: ZYX-S2 3 Axis Gyro. • Precision 3-axis gyro stabilization. ZYX-S2 3 Axis Gyro x 1. Gyro shockproof Pad x 5. Supporting firmware upgrade,Supporting Multi-Blade Rotor Head. • Supports helicopters from 200~800 size. 1 x JHE42B Finder. How to turn off the buzzer Press and hold the release button for more than 2 seconds, then the finder turns off the sound. Model Number Our goal is. We will be responsible for. ARKBIRD with 3 Axis Accelerate speed, gyro system. - 3 Axis Accelerate speed, gyro system, even for tough weather. - One button hover mode. regard the hover position as balance position. Easy to adjust, support delta-wing. Horizontal precision: 2.0m at open space. Speed precision: 0.1m/s(without aid). Module Pin TX, data module output. RX, data entry module. Acceleration precision: 0.1m/s2(without aid). iPower Motor. Work temperature: -40~ 85°C. Therefore, we ask you to check your thread size before you buy! Thread: M4. Color: Red. Gyro:MPU6000 or ICM20689. Size:40 40mm. Beyblade Burst String Launcher. 1x Launcher. Compatible with all Burst Series Beyblades. ★Interface: RS232 TTL. Also note that monitor settings may vary from computer to computer and may distort actual colors. And due to the difference between different monitors, the picture may not reflect the actual color of the item. To your country. Write to us . Other countries - ask. Therefore, we ask you to check your thread size before you buy! Stick aluminium M3 thread short in blue. Thread: M3. RC-model construction / stand model construction accessories - share in. Color: blue. Therefore, we ask you to check your thread size before you buy! Thread: M4. Color: Black. Therefore, we ask you to check your thread size before you buy! Thread: M4. Color: purple. RC-model construction / stand model construction accessories - share in. Fast Support. 1 x KBAR 3 Axis Gyro. Model: K8 Mini K-Bar Gyro. You can set it via computer or with Android phones via bluetooth. 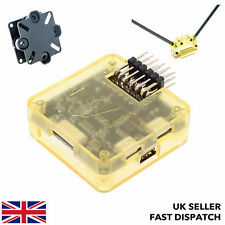 You can download the software and manual from here 1 x 3Pin to 1Pinx3 cable. - Weight : about 12g. Make sure you disconnect your USB cable from the APM. 2 board before attempting to use the OSD. This is useful if you're flying in First Person View (FPV) mode or don't want to use a laptop at the field to see. Mini Drill Set, 20 Piece set includes sizes #60 to 80. Accessories : flying gyro 1, charging cable 1, manual 1. If you encounter any trouble. Charging current : 5V 0.6A. Gross weight: 70 grams. 1x DUALSKY FC151 3-Axis Gyro Stabilizer. Support single/double aileron, fly wing and V-tail aircraft. Support mode switch via extra channel, can be switched between different modes. Program via button and LEDs. Add switch channel to switch mode during flight. Note:Light shooting and different displays may cause the color of the item in the picture a little different from the real thing. Color: Black. EAN Does Not Apply. UPC Does Not Apply. ISBN Does Not Apply. Marke Markenlos. To your country. Write to us. Ask other countries-.